BlackHat Hackers are in (evil) Thinking Business. Are we? If BlackHat hackers of the planet were using scanners or prefabricated scripts to hack the software, then the White-Hat hackers using the same set of scanners to discover the vulnerabilities could help in securing the software against them. Unfortunately, that’s not the case. Is it? Even after using well known scanners and tools, we still get exploited by malicious hackers. For many decades, malicious hackers of the planet have evolved super crazily in hacking the software systems. On the other end, the white-hat hackers have been more worried about their certifications, increasing their pay, securing their jobs instead of securing the software very well. Well, these are totally extrinsic motivations. BlackHat hackers are mixed breed of extrinsic and intrinsic motivation. The time has come where we start thinking evil in order to secure our systems. If we are fighting the black hat world, then we have to know their laws and learn from the black hat world and their thinking. Tools have always come next to malicious hackers, but their intent and ideas of being creative has made them great. 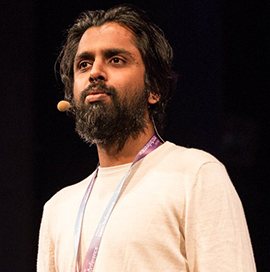 In this talk, Santhosh Tuppad is going to speak about his hacking experiences and connecting the software with the real world scenarios and share his knowledge about how powerful thinking can nurture us to fight the crime world and build better secure systems. Well, hacking is a continued business between good and bad, so is thinking business. Be ready to experience how thinking hacking opens doors, windows, rat holes, loopholes, vulnerabilities, insecurity of the software systems. If you are open to new ideas and practicing thinking, then you will have fun in this talk. Even otherwise, you will become open to new ideas and the beauty of thinking. Santhosh Tuppad has played different roles in his life which include being an entrepreneur, liar, lover, boyfriend, husband, thief, passionate software tester, blogger, reader, trainer, coach, black-hat hacker, white-hat hacker, grey-hat hacker and what not. In this amazing journey of life, he has experienced his salvation. Not to forget that, “Salvation comes at a price” and of course he has paid that price. Before he was known for being merciless, ruthless, unkind, evil etc. And today he is known for kindness, humbleness, and some people call him “Privacy Fighter”.